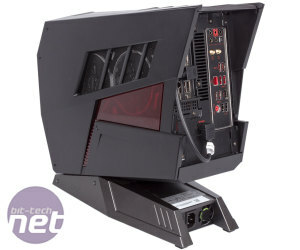 While MSI is better known on these pages for its motherboards and graphics cards, it also uses its expertise in these fields to sell full desktop systems with custom designs. 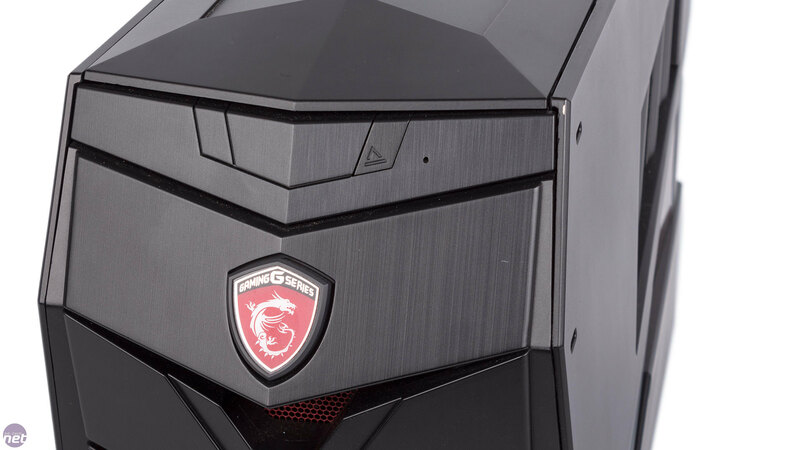 The Aegis X is the latest to join the family, and its £2,200 price tag tells us MSI is targeting users that want a premium experience without the hassle of building a PC themselves. 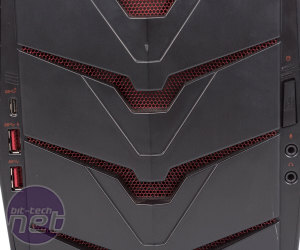 The most striking aspect of the Aegis X is certainly the custom chassis. With its sharp angles, numerous vents and red and black colour scheme, it clearly stands out – whether for good or bad reasons is for you to decide. 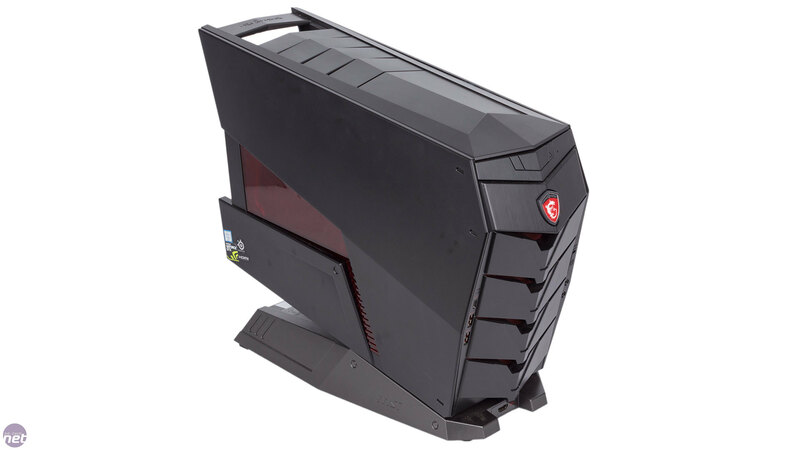 What we can say for certain is that it's relatively compact compared to standard tower cases (the overall volume is less than 20L), so for portability the Aegis X has some merit, with a strong handle at the back of the roof in case you ever need to lug it to a LAN party or the like. 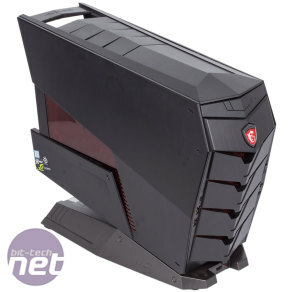 There's a small red window on either side and MSI spruces up the front of the case by having the grilles here lit by RGB lighting that you can control via pre-installed software. 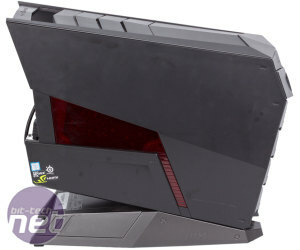 Still, despite the price tag, the Aegis X doesn't look or feel premium, mainly due to the heavy use of plastic on the outside – it covers pretty much all the panels. The front has an okay brushed metal finish to it, but we can't help but feel that a steel or even aluminium exterior would have boosted the case's appeal significantly. One of the panels was also slightly misaligned, but the chassis looked like it had taken a bit of a beating from whoever had it before us so we'll let that one slide. That said, we're not keen on the notches and rails system that the panels attach with. It's admittedly not a system designed to be tinkered with very often, if at all, but even so both getting in and closing the case back up involved considerable wiggling. Design issues aside, the front of the system is well designed with plenty of features. At the top is a slimline DVD drive that's neatly integrated. You also get a front-facing USB 3.1 Type-C connector besides the usual pair of USB 3.0 ports, and if you look at the bottom there's even a HDMI port. This, as you might have guessed, is for VR headsets. 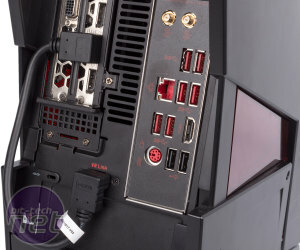 The port is connected to a rear-facing port via an internal cable, and all you have to do is connect this to the graphics card's HDMI output via the supplied, perfectly sized cable. 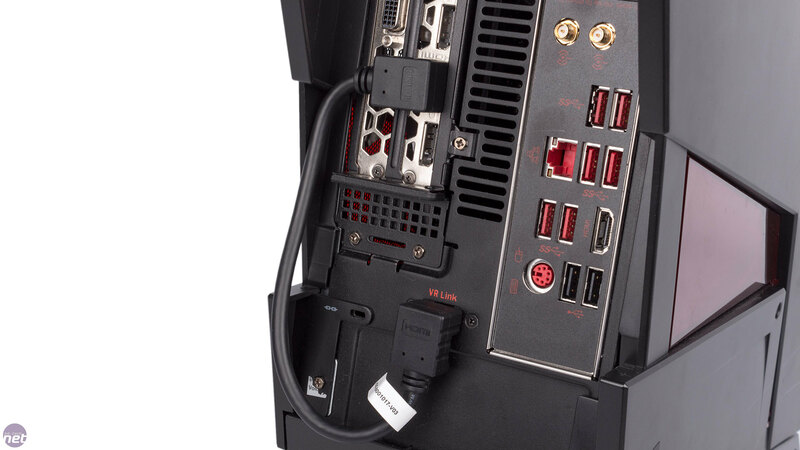 There's no reset button on this system, but elsewhere connectivity is strong with plenty of additional USB ports on the back, optical S/PDIF and Killer Ethernet and wireless networking. Moving inside, MSI has packed a lot of powerful hardware into this case. The custom Z170 motherboard plays host to the top-end chip for that platform, the Core i7-6700K. As has been suggested already, this isn't really a system for those that like to fiddle with their hardware or settings. 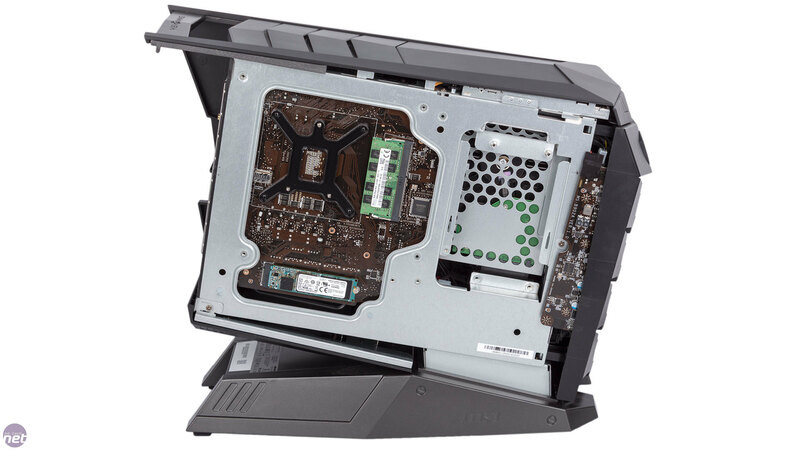 As such, the EFI for the motherboard is sparse with very few options. The CPU is overclocked to a modest 4.2GHz with an unknown voltage setting. In default mode, this is its peak boost speed, but it will clock down when not being fully utilised (standard behaviour for modern CPUs). However, press the large OC Genie button on the front and the speed is locked to a constant 4.2GHz. You can activate and deactivate OC mode without rebooting, although given that the peak speed isn't changed, you're unlikely to notice much difference either way. To save space, MSI's motherboard uses SODIMM memory rather than regular DDR4 modules. You get a pair of 8GB sticks, one on the front of the board and one on the rear, and they run at 2,133MHz. 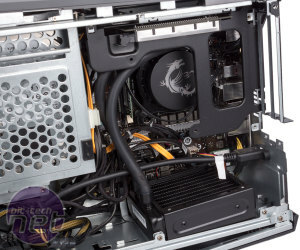 PCI-E riser hardware allows the graphics card to be installed parallel to the motherboard. 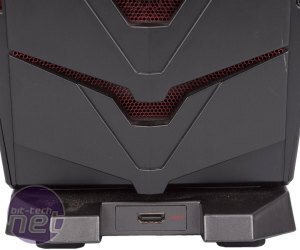 In our sample, MSI is using its GTX 1080 Armor 8G card, but tells us that this will change to the GTX 1080 Gaming 8G model in the final Aegis X, which should be a touch cooler and quieter. Either way, the GTX 1080 is a monster, so you can be sure of some very high frame rates. 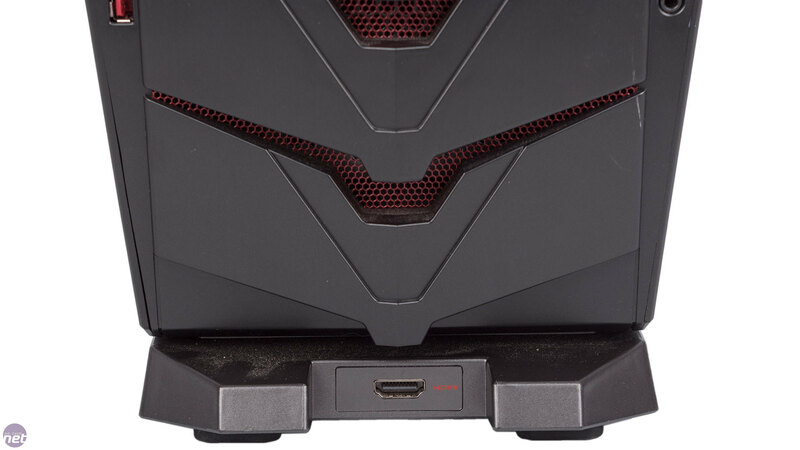 With the Gaming card, the OC Genie button will also automatically set the GPU to OC Mode. The internal storage also impresses. 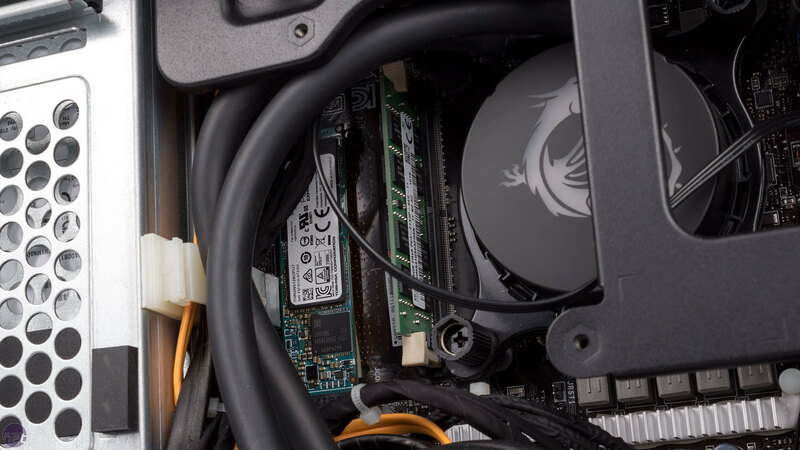 MSI is dual-wielding 128GB M.2 NVMe SSDs in a Raid 0 array for maximum speed. As with the memory, one SSD is fitted to the front of the motherboard and another to the rear. Complementing this 256GB of super-fast storage is a 2TB 3.5in drive. 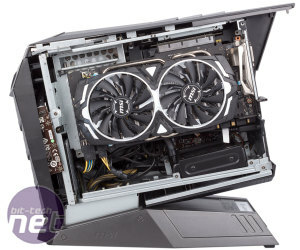 To keep the size down, MSI is not using an ATX or even an SFX PSU. Instead, the base of the chassis plays host to a custom design. 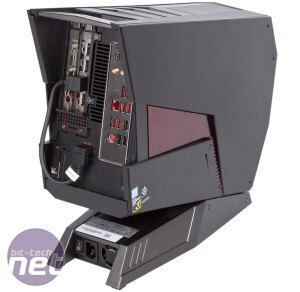 It can pump out up to 600W, which is more than enough for the hardware here, but sadly only has 80 Plus Silver efficiency. 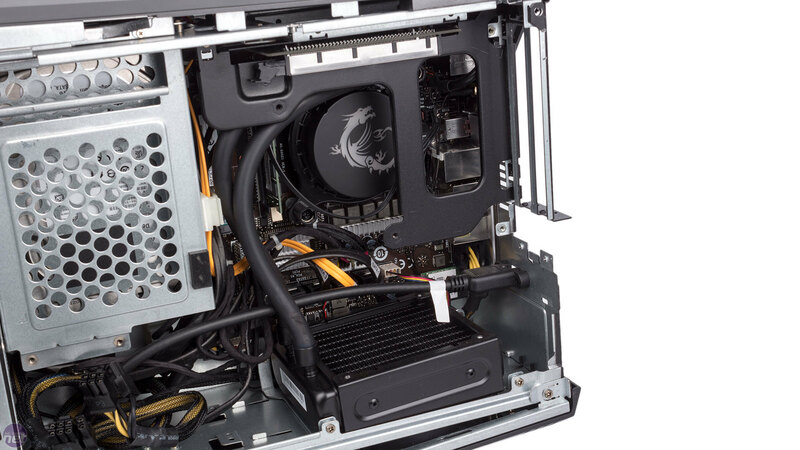 Pairing powerful hardware with a small chassis means cooling requires some thought. 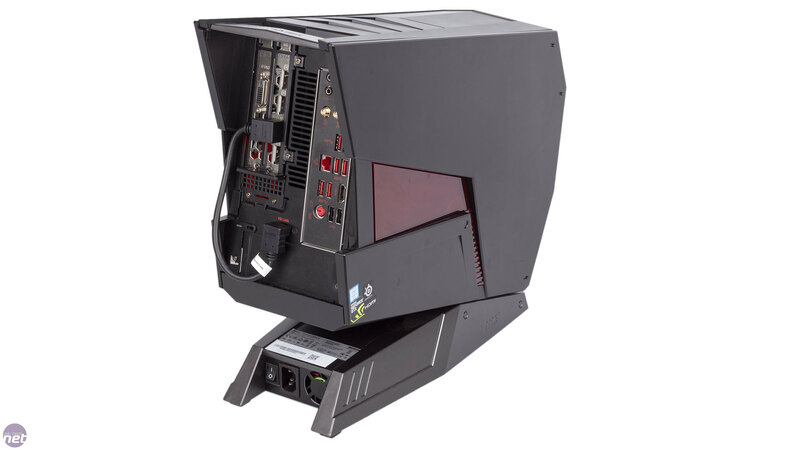 The PSU is isolated in the lower chamber, while the main area has a single front intake fan behind the front mesh. 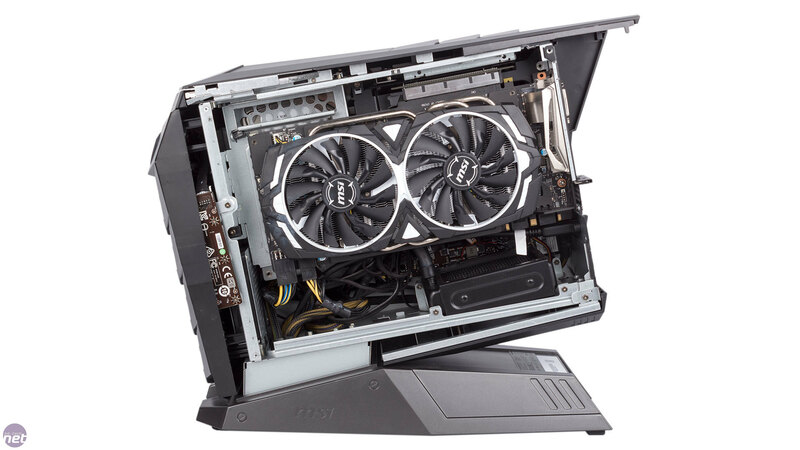 The GPU is mostly reliant on its own cooler, but being positioned right next to the side vents this shouldn't be too big an issue. 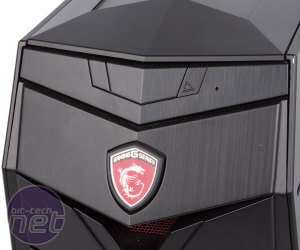 Meanwhile, the CPU is cooled by a small MSI Dragon series all-in-one liquid cooler with a 92mm fan, which acts as the case's only exhaust fan. 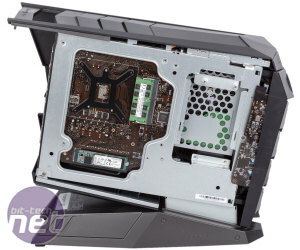 MSI has even cooled the SSD on the rear of the motherboard, using thermal padding to connect it to the internal metal part of the side panel such that it acta as a heatsink. 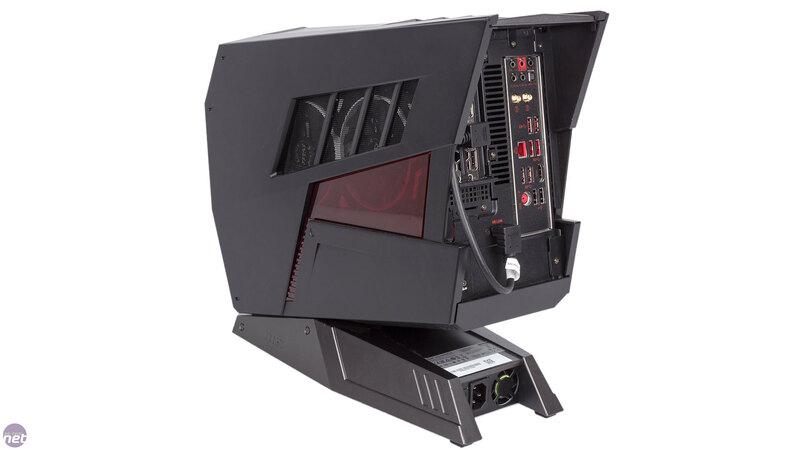 The two fans are controlled based on the CPU temperature, but the BIOS does not allow you to change the profile of either one. This makes sense, as MSI needs to ensure all users have adequate cooling. Windows 10 Home 64-bit is installed by default. This is the de facto choice, of course, although we have to admit we found the additional software a bit irritating, with various notifications popping up on each log in. It's not a difficult issue to deal with, but we'd still prefer a more lightweight, less intrusive approach as this is what we're used to from system integrators. 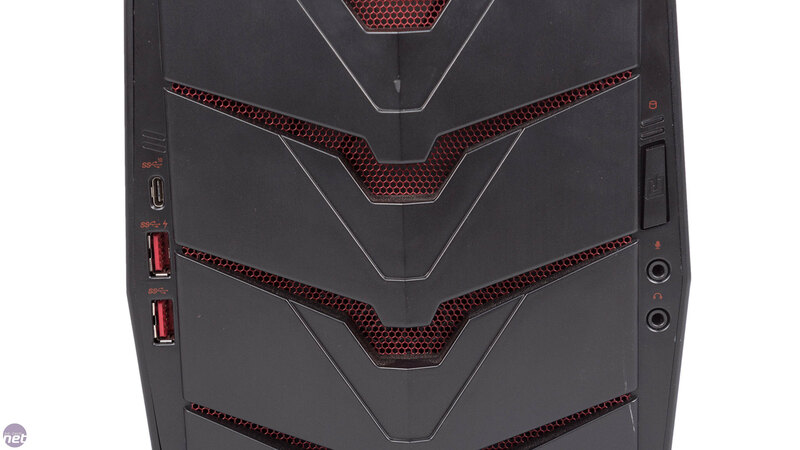 The Aegis X comes with a two-year manufacturer's warranty, which is pretty good for a full system. 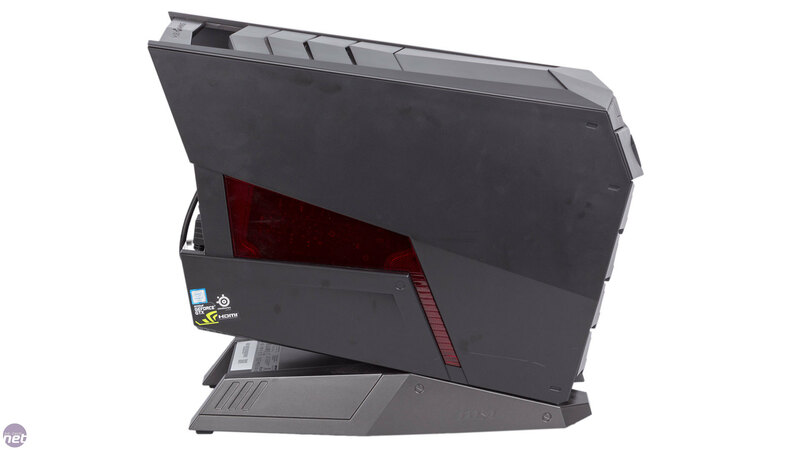 With the slightly awkward panels and tightly packed design, the Aegis X doesn't lend itself to easy upgrading. The graphics card is easy to get out, but the SSDs and memory are more complicated – you get very easy access to the ones on the back of the motherboard, but the ones on the front side are much harder to get at, and you're unlikely to only ever be swapping out one. Despite a warranty void sticker covering one of the side panel screws, MSI has confirmed that it will honour warranties for systems that have been upgraded, provided the user isn't responsible for any damage. Still, for most people we think the hardware inside will be more than enough to last a couple of years anyway.